Historian Randall Balmer made the case recently in the pages of Politico that the Christian Right did not emerge as a response to loosened abortion laws. Rather, the “real” roots of the New Right, Balmer argues, were in the defense of racial segregation. Unfortunately, the argument looks more like punditry than history. The Roots of Racist Academies? In other words, in the late 1970s, evangelical Protestants got involved in politics in big numbers because they were worried about preserving their status as a certain sort of favored class in American life. This included things such as racial segregation, but to say that racial segregationism drove the movement is woefully misleading. It was a broad sweep of issues, most urgently educational issues, that drove evangelicals back into politics in the 1970s. Balmer makes the solid case that abortion did not spark the emergence of the New Christian Right. The timing just doesn’t work. In the immediate aftermath of the Roe v. Wade decision, evangelicals seemed largely indifferent to the issue of abortion. For readers who find this hard to believe, a look at Daniel Williams’ book God’s Own Party will help. What DID motivate conservative evangelicals, Balmer notes, was the increasing pressure on private religious schools from the IRS. In the wake of decades of desegregation laws, the federal government had begun revoking tax exemptions from private schools that discriminated on the basis of race. As Balmer correctly points out, this anti-federal animus motivated far more conservative evangelicals in the 1970s than did pro-life campaigns. the real roots of the religious right lie not the defense of a fetus but in the defense of racial segregation. It is true that school segregation played a role in the rise of the evangelical private school movement. And it is certainly true that Bob Jones University maintained a rigorous white supremacist position long after most other white conservatives had abandoned it. But to argue that racial segregation somehow formed the “real roots” of the New Christian Right oversimplifies the historical realities. Please don’t get me wrong: I’m no apologist for racism or for conservative evangelicalism. I agree that many white conservative evangelicals, like other white Americans, had and have a shameful attitude toward racial equality and racial integration. My argument is an academic one: If we want to understand the history of conservative evangelicalism, we won’t get far by insisting that racism was the “real root” of their political activism in the 1970s. That sort of argument is sadly similar to attempts by conservatives to smear all Democrats by citing the radical words of leftists such as Saul Alinsky or Bill Ayers. It’s not that some Democrats don’t sympathize or even follow Alinsky or Ayers. But to say that such folks are the “real root” of liberal thinking is just not accurate. 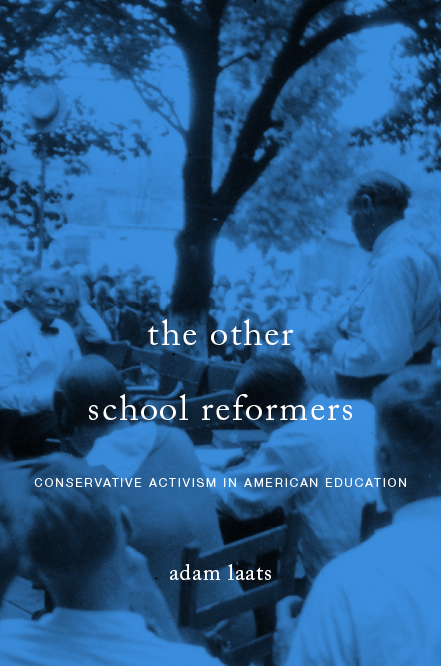 To make a better historical case, Balmer should have argued that issues about schooling motivated evangelicals in the 1970s to get involved in politics. Those issues included racial segregation, but they also included questions of school discipline, perceived drug use at schools, perceived immorality at public schools, and a host of other issues. For all these reasons, a burst of new private schools popped up to serve conservative evangelical families. And the defense of such schools drove many evangelicals into politics in the 1970s. Were these schools “segregation academies?” The history is clear, but not simple. Certainly, some white evangelical parents—along with white non-religious parents—chose private religious schools as safe racist harbors in the days of school desegregation. The timing proves it. Though many evangelical parents may have cited 1960s Supreme Court rulings such as Engel v. Vitale (1962) or Abington v. Schempp (1963) as the time when public schools went to hell, the burst of private Christian schools did not happen until the late 1970s. Not coincidentally, those were the years when large school districts came under pressure for the first time to desegregate by race. But we commit an intellectual error if we conclude glibly that such schools ONLY represented racist havens. I’ve wrestled with the question of “Christian day” schools and racial segregation in a book chapter a few years back. Consider a couple of complicating factors. The situation in Louisville, for instance, seems at first to confirm the hypothesis of racial integration as a primary factor in the growth of private evangelical schools. After that city’s court order to bus children in 1974 as part of an ambitious desegregation plan, there was a spike in enrollment at the city’s existing Catholic and secular private schools. In addition, a crop of new evangelical schools immediately opened to serve white families who did not want to bus their children. One study found that most of the parents at these new evangelical schools identified desegregation as their primary reason for leaving the public schools. Another academic study of Louisville’s desegregation history, however, suggests some important qualifications. At two private evangelical schools that had existed for years before the 1974 court order, only one of sixty-eight fundamentalist families used the schools as a “haven” from busing. Although whites fled from public schools to a range of private schools, this indicates that at least some of the existing evangelical schools did not take advantage of the surge of white interest in private education. Another statistic that confounds glib conclusions about the primarily racial motivation for new Christian schools is that the largest recipient of white students fleeing from desegregation was not private evangelical schools but rather the booming suburban public high schools of the 1970s and 1980s. Contrary to popular impressions, throughout the 1970s and 1980s, the numbers of students attending private schools nationwide dropped from 13.6 percent in 1960 to 9.8 percent in 1990. Meanwhile, the proportion of white students attending public elementary and high schools nationwide increased markedly. Those students, however, had moved mainly into suburban public schools. For instance, the suburban schools surrounding Atlanta served ninety-eight percent of the area’s white students in 1986. Throughout the twentieth century, conservative evangelicals cared deeply about education. In the 1970s, savvy political organizers recognized that many evangelicals thought schooling had become threatened. As Professor Balmer correctly points out, part of that perception came from the perceived “threat” of racial mixing in schools. But that was only one element of the perceived danger to education. The real roots of the Christian Right can’t be limited only to racism. Rather, we will do well to understand how profoundly important educational issues were to the new political mobilization that swept evangelical America in the 1970s.